Lewis Hayden was born a slave in Lexington, Kentucky in 1811 into the household of the Rev. Adam Runkin, a Presbyterian minister. In 1840 he married fellow slave, Harriet Bell (c.1811-1893). The Haydens successfully escaped slavery in 1844. They traveled to Ohio, Canada, Michigan, and finally settled in Boston, Massachusetts, where they became active participants in abolitionist activities. While Harriett ran a boarding house from their home at 66 Phillips Street and raised their two children, Joseph and Elizabeth, Lewis ran a successful clothing store on Cambridge Street, where he also held abolitionist meetings and outfitted runaway slaves. Their home, which contained a secret tunnel, served as a stop on the Underground Railroad. The Hayden home is now listed as a national historic site. 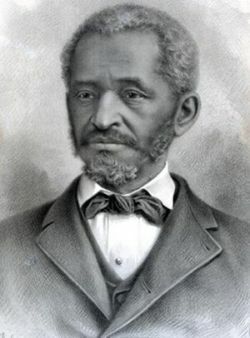 Lewis Hayden was a member of the city’s abolitionist Vigilance Committee, whose goal was to protect fugitive slaves from being captured and returned to slavery under the 1850 Fugitive Slave Act. In 1850, the Haydens assisted a fugitive slave couple, William and Ellen Craft, who had escaped from Georgia. Lewis also led in the well-publicized rescues of Fredric Wilkins, alias Shadrach Minkins, in 1851 from a Boston courthouse, and Anthony Burns in 1854. After the Civil War, Hayden was active in a number of causes, including in the effort to promote free masonry among black men, women’s suffrage, and black education. In his own city of Boston, he pushed for the erection of a monument to honor Crispus Attucks, the first black person to die in the American Revolution, which the city established in 1887. Lewis Hayden died in Boston in April 1889. Stanley J. And Anita W. Robboy, “Lewis Hayden: From Fugitive Slave to Statesman,” New England Quarterly, 46 (1973): 591-613, and https://www.nps.gov/index.htm. Statesman,” New England Quarterly, 46 (1973): 591-613, and https://www.nps.gov/index.htm.